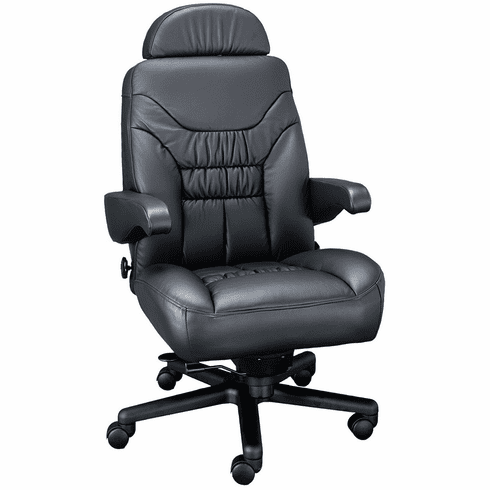 This executive chair from ERA is Limited in name only – it delivers everything the big and tall person could want in an office chair, with thick, contoured cushions, adjustable seat depth, full four-way adjustable lumbar support, a rocker reclining seat back, pneumatic seat adjustment, and more. All the features you need for your comfort are unlimited! It’s rated for people up to 500 pounds, and you can even choose an optional 30-inch all-steel base upgrade for additional stability. Flip-up arms make it easy to get in and out of this chair, and it’s GSA approved for 24-hour use. You can choose from fabric, vinyl, leather with mock leather trim, or even all leather. And ERA offers a lifetime warranty!